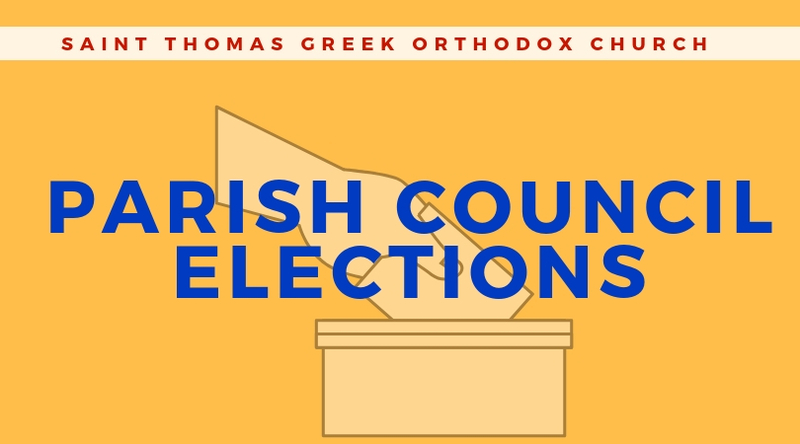 On Sunday, December 2, 2018, following the Divine Liturgy elections will be held for the purpose of electing nine (9) members of the Parish Council. The elections will be conducted between 12 to 5pm in the Danielle Kousoulis Greek Cultural Center. We remind all eligible parishioners to participate in the elections and support the efforts of those who serve our Church and Parish Council. Absentee ballots will be available for the ill, the infirm or for parishioners who will be out of town. These ballots will be available at the Church Office during business hours starting Monday, Nov. 19 until Friday, Nov. 30 at 4 pm. You must have your 2018 Stewardship completed to vote. The Stewardship Committee will also be available to accept your generous contributions during the elections. George G. Horiates, Christopher Diamantoukos, George Gavras, Marina Shook, Dimitrios Rozanitis, Jerry G. Kappatos, Constantine E. Horiates, Alex Kokolis, William Fotiou. Please contact the church office for more information at 856-665-1731.